Santa Fe Dehumidifiers are among the most highly regarded units for use in the demanding conditions found in many basements and crawl spaces. A specialized basement model is not always the only cure for a basement moisture problem, often a large capacity portable unit will perform just as well and costs only a fraction of the price. If you happen to live in one of the cooler areas of the country, however, at some times of the year the temperature in your basement may fall too low for a portable to be effective. In such circumstances a basement model, designed for the purpose, may be the best option and, perhaps surprisingly, the cheapest to install. The same applies to your crawl space, with even greater force. A crawl space is often an even more hostile environment for any temperature sensitive appliance and, by definition, there is not much head room. A crawl space model is low in height and compact; it is designed to commercial standards and is more robust; it can operate in lower temperatures and needs little maintenance. The argument in favor of a specialized unit can often be even more compelling for your crawl space than for your basement. 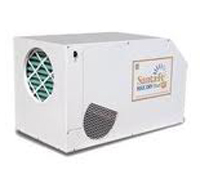 Santa Fe Dehumidifiers are among the best basement and crawl space models money can buy. They have a few equals but no other brand is better. Santa Fe is a brand name; so who manufactures these exceptional appliances? The Santa Fe Dehumidifier is manufactured by the Therma-Stor company located in Madison, Wisconsin. The company was founded in 1977 and its first products were heat recovery water heaters. A little later it began production of the Santa Fe range of free standing dehumidifiers for basements and crawl spaces and the Ultra-Aire range of ducted and installed whole house units. It also manufactures commercial models and the Phoenix line of restoration equipment for lowering humidity, air scrubbing, water extraction, and evaporative drying. 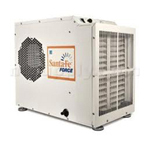 Santa Fe units are highly valued and respected for their energy efficiency and effectiveness. Designed for crawl spaces and basements the Santa Fe Compact Crawl Space unit is small enough to fit comfortably into the restricted height available in a crawl space yet powerful enough to keep a medium-sized area, up to 1800 sq ft, free from damp. This Energy Star® certified appliance can operate at temperatures down to 40°F. The Santa Fe Classic Basement model is a 110 pint per day, high capacity unit designed for effective operation in even the dampest basement. Suitable for an area of up to 2,500 sq ft the Santa Fe Classic is optimised for low temperature operation and can tackle the tough conditions found in many basements effectively and with excellent energy efficiency. 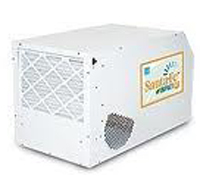 For larger crawl spaces, up to 2,200 sq ft the Santa Fe Advance Crawl Space Dehumidifier is a 90 pint per day machine capable of operating at low temperature and is Energy Star® certified for economical use of power. 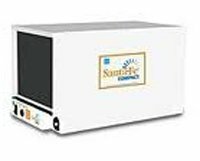 Equally suitable for a basement this Santa Fe Dehumidifier has a low profile design to ensure it can be installed in any crawl space. Designed specifically for finished basements and domestic use the Santa Fe Rx comes in an eye friendly matte white design that suits most room styles. No compromise is made in performance, however as the Santa Fe Rx is a 74 pint, energy efficient unit suitable for an area of up to 2,200 sq ft.
For the giant basement or crawl space Therma-Stor offers the Santa Fe Max Dry Dual XT with a massive water extraction capability of 150 pints per day, enough for an area of up to 3,600 sq ft. With Energy Star® certification for efficient energy use and the ability to operate at temperatures down to 45°F this unit is ideal for the larger crawl space or basement. The Santa Fe Impact is a brand new addition to the Santa Fe Dehumidifier range. 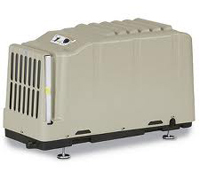 It is a crawl space dehumidifier but is equally suitable for use in your basement. With the Impact Santa Fe have stretched your energy dollars even further and produced a model which can remove 4.2 litres of water for every kilowatt hour it consumes. This level of energy efficiency sets new standards for a residential unit and will prove a tough target for other manufacturers to beat. The Santa Fe Force is the newest addition to this popular range. It is a high capacity crawl space unit with a moisture removal rate of 120 pints every 24 hours, sufficient for a space of up to 2900 square feet. While this is a sound appliance I feel that there are other models in the Santa Fe dehumidifier line-up that you may prefer. Read my full review to find out why.